Now is the time to practice the basics: sit, stay, come, and most importantly to “check in” with you. Start with short training sessions (15 minutes) twice a day in a distraction-free area. Initially, you will likely need to use small pieces of a high value treat to shape and reward the desired behavior. Having trouble? Consider enlisting the services of a trainer now, to avoid issues and disappointment later. Gradually introduce distractions in your training sessions; strange people, sounds, and sights can make a seemingly trained dog lose their focus…not something you want to worry about on your wedding day! You may also want work your dog’s socialization (here’s a great article on how to socialize your dog successfully). If possible, bring your dog to your chosen venue and let him/her have a bit of a look around. If it is not possible, then make sure you’re keeping up with his/her training and socialization. It’s also time for another assessment. 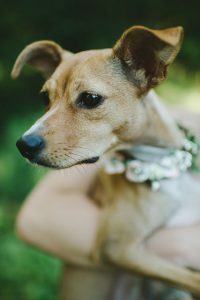 If they are not progressing, are showing signs of anxiety or stress when meeting new people, it may mean they aren’t suited to participate in your wedding and you may have to consider taking photos before the ceremony, with friends/family that your dog feels comfortable with. Decide who in your wedding party will be responsible for taking care of your dog’s needs at the ceremony and photos. At this point, your dog should be able to listen and respond reliably despite a variety of distractions. Pack a small bag with water/bowl, treats, food, doggy bags, and anything else your dog might need, while they’re away from home. Finally, your hard work will pay off today. Your dog should be ready to share this memorable occasion with you!